Wales coach Warren Gatland has signed a four-year contract extension with the Welsh Rugby Union taking him to the end of the 2015 Rugby World Cup. The 47-year-old has ended speculation he could be returning to New Zealand to take up a coaching role at his home-town club Super 15 side Waikato Chiefs. Gatland boosted Welsh rugby hours prior to naming his 2010 autumn series squad. "I am extremely proud of the honour I have in taking Wales into the next two Rugby World Cups," said Gatland. Wales' 2008 Grand Slam-winning coach, whose current deal was due to expire after the 2011 Rugby World Cup, conceded he considered returning home for "family reasons." September's Scrum V: Coach Warren Gatland on Wales... and beyond? But Galand now insists he is "looking forward to the challenge" of becoming Welsh rugby's longest-serving national coach in their history. 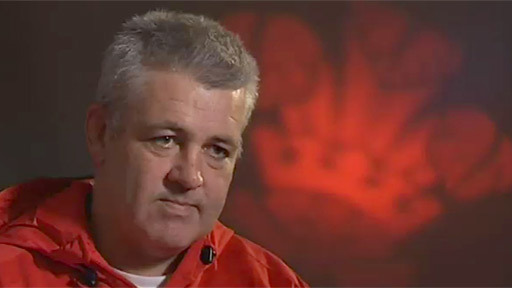 "I made no secret of the family reasons which have made me consider returning to the southern hemisphere," admitted Gatland in a WRU statement. "But it is a measure of how devoted I am to Wales that I want to stay. "I have chosen to stay in Wales because of my confidence in the players we have, the coaching structures we have developed and the succession plan of talent we now constantly update, all fully resourced and supported by the WRU. "I know the other major rugby nations take us seriously as opponents who can play excellent rugby and that inspires me to help take this group of players even further. "There is an incredible amount of hard work ahead but, with the continued backing of the Welsh Rugby Union, the national squad now has the means to deliver what the Welsh public want." WRU group chief executive Roger Lewis conceded Gatland has a release clause in his new and improved contract that he could leave his post as Wales coach should either party want a change with the next four years. "The contract we have entered into, of course, has protection for the Welsh Rugby Union but also Warren as well," revealed Lewis. "There are safeguards in place to deal with the 'what ifs.'" Gatland won the Six Nations Championship and Grand Slam in his first tournament after being appointed Wales coach in December 2007. But Wales have been just fourth in the last two Six Nations Championships - and have struggled to just two victories in 2010, winning just three of their last 10 matches - against Italy, Scotland and Argentina. Gatland has won 14 and lost 14 of his 28 games in charge and has led his side to just one win over Tri Nations opposition, the 21-18 victory over Australia in Cardiff in November 2008. The former London Wasps Heineken Cup winning coach admitted last month that he had to "weigh up" his contract offer from the Welsh Rugby Union "with family pressure to return to New Zealand" where his children are "quite keen to have their dad home." But Gatland agreed a deal on the eve of announcing his autumn Test squad where Wales will welcome rugby's top three international sides Australia, world champions South Africa and Tri Nations champions New Zealand to Cardiff in November. The Wallabies open the autumn campaign - described by Gatland as a 2011 Rugby World Cup "yardstick" - at the Millennium Stadium on Saturday, 6 November while Wales also host 2007 World Cup bogey team Fiji in November. Gatland, who led Ireland to the 1999 World Cup, believes his current squad has the basis of his World Cup squad to go to the 2015 World Cup in England. "Potentially in 2015, Wales will only lose four or five players," Gatland had admitted previously . "Perhaps Martyn Williams, Shane Williams, Stephen Jones and Lee Byrne. "They would be an old side, but very experienced and with a lot of caps." Welsh rugby has a reputation of being trigger-happy and firing national coaches quickly so this unprecedented stance of tying down coach on a long-term deal is a new direction for the WRU. 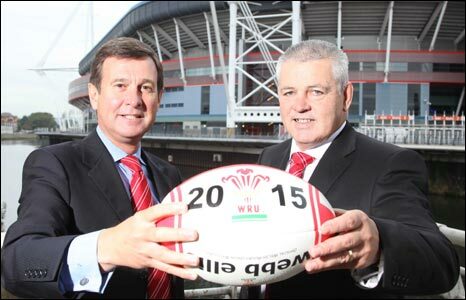 But WRU boss Lewis admitted: "The board of the WRU voted unanimously in support of this recommendation. "We have a meticulous and professional coaching and rugby management structure in place which is a great credit to Warren." "By signing him for a further four years we have ensured that the systems in place will continue to develop for the future of the international game in Wales. "It is important that we achieve continuity at the highest level which is why we have also planned our Wales international touring fixture schedule right through until 2019 alongside our Autumn Test series." And WRU chairman David Pickering added: "Throughout a formidable coaching career Warren Gatland has achieved the stature which we want and expect every coach of Wales to possess. "He has made a huge and positive difference to the Wales team throughout his tenure so far and we know he will endeavour to build on that improvement in the years ahead."